Even today Google’s bread and butter is still in their search algorithm. This is why Google will do everything to stop you from messing with their search engines. The quality of Google’s search experience is a key to why they are still the number one search engine to this day. As a result, you better watch out if your site doesn’t comply with the Webmaster Guidelines or else you may get penalized! Just look at that graph up above. Isn’t it kind of frightening? What Does It Mean To Be Penalized By Google? Adding original and quality content will certainly attract many loyal visitors to your website. In fact, Google’s search algorithm has been finely tuned to reward that practice over the years. Pumping out more quality content will slowly but surely help you earn higher rankings on the search engine results page. After all, you’re looking for your site to have a high ranking to bring in more business. Google’s algorithm is looking to highly rank content that is most relevant and enhances the search experience. With this dissonance, there is bound to be some cheating, and for those folks, Google fights back.. and hard too. Remember that Rap Genius fiasco? That was only one high profile case of something happens all of the time… and even more cases are sprouting up as Google is changing its algorithm in its war against spam. If you’ve received a Google manual penalty, it means that someone from the company has flagged your website and is now issuing you a penalty after a careful review. Remember that to receive this notification, you need to be signed on with Google Webmaster Tools. You also only receive this message when you are receiving a manual Google penalty, not an algorithmic one. With the algorithmic penalty, this happens naturally when Google’s algorithm changes, and no actual human being at Google has flagged your site. The algorithmic Google penalty is a tough one to deal with since you’ll have no idea what may have caused it unless you do a lot of research. Another way to tell is to obviously just check yourself. Did you used to be on the first page and now can’t even find yourself? Yeah… you may have a penalty to contend with. But rather than going on that long, possibly depressing search, you can also check to see if your site is still even being indexed. To do this, type in the simple query site:yoursite.com. If you didn’t receive an email from Google, but have found that your site is not being indexed anymore, do your homework on some of the recent algorithm changes. You may find that you are violating one the changes and you should try to get it back on the right track. When you’re doing this, document everything for the reconsideration process. 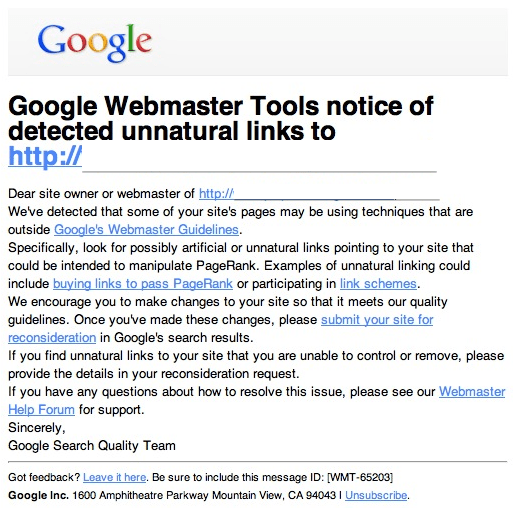 If your website was penalized, then there is a possibility that Google has directly informed you about it through Google Webmaster Tools. If you haven’t installed it yet, then this might be a good time, since it will offer you great features to monitor your website’s overall health. To manually check and see if your site has been penalized, you can select Manual Actions from the Search Traffic menu of your Webmaster Tools dashboard. So What Can You Do From Here? There are plenty of things you can do for yourself to recover from a penalty. This is something that I also cover in another post about recovering from manual Google penalties. If you do receive a penalty, I wish you the best of luck and if you have any questions please feel free to contact me. I’m just an email away. Charlie Patel is a world traveler, WordPress geek, serial entrepreneur, & consultant to big-shots in the corporate world and on the web. Otherwise, he's just planning the next trip or in some far-away land. He runs WPsite.net (this awesome site!). Want a 25% discount on plugins? Receive a 25% discount code for 99 Robots plugins when you sign up to the newsletter!